He-man and the Masters of the Universe is a 1980’s animated series spanning 130 episodes. The series follows the hero, He-man and his friends. The heroic warriors fight an endless battle against the evil forces of Skeletor. So that we don’t retread the same information, this article serves as a base camp. It details attributes of the series, its history, and the planet Eternia. Individual writeups may reference specific locations and more in this article. This article holds links to all published writeups for this He-man and the Masters of the Universe series. Plus a link to the equivalent “base camp” article for She-Ra: Princess of Power. All articles are based only on the Filmation animated series. 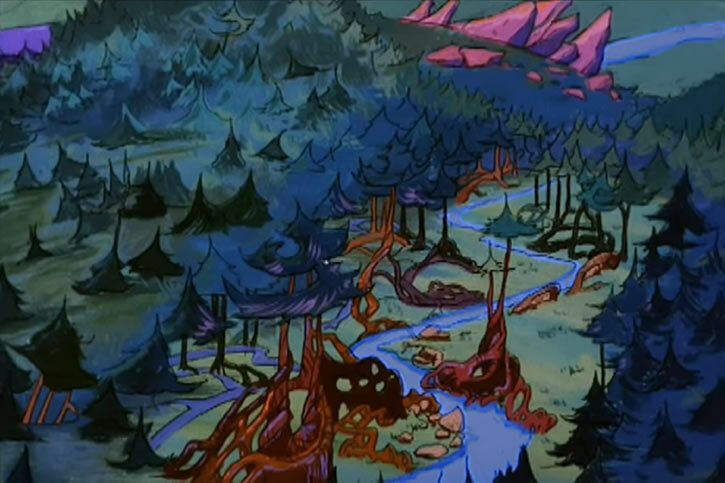 As seen throughout the He-man and She-Ra series (1983 – 1987). Three places of import. The major players live here. The Royal Palace. Home base for the heroes. Snake Mountain. Home base for the villains. Castle Grayskull. Contested magical castle containing powerful secrets. The heroes have possession. These link to individual profiles and articles as they get published. Eternian animals of the Masters of the Universe. Billions of years ago, an explosion created the universe that is home to the planet Eternia. At Eternia’s core was a small leftover piece of that explosion, the Star Seed. The very energy that set the stars burning and the planets spinning. It rested at Eternia’s center until modern times when He-man retrieved it. He-man handed it over to the Cosmic Enforcer, Zodak. A powerful being of pure energy called the Energy Beast was also created during the planet’s formation. For millions of years it was imprisoned at Eternia’s molten center. During a prehistoric volcanic eruption, which formed Mount Eternia, the creature escaped to the surface. The beast terrorized early Eternians until they learned how to imprison its terrible power. 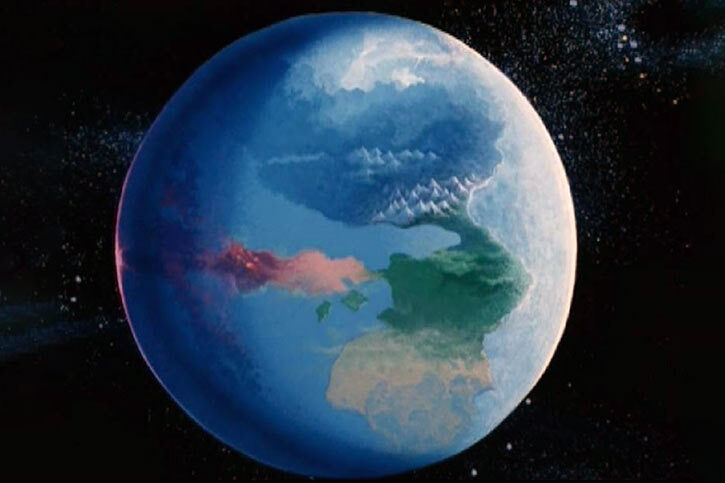 The home planet, Eternia, is located directly at the center of the universe. Eternia is known for its mix of science and magic. Rocket ships and advanced technology alongside wizards, swords, and ancient technologies. The planet is home to ancient ruins, vast unexplored regions, its myriad diverse races, and savage creatures lying in wait. Caverns run under all of Eternia. Eternia has a dark side where many evils live (The Great Books Mystery). Out of Eternia’s past are many myths and legends. Most turn out to be true. The Ancient Archives among others only record back to the building of Castle Grayskull. There are many ruins of ancient civilizations dotting the globe. What happened to those civilizations? There are only hints of a Great War. Twin moons orbit Eternia. One moon of light the other of darkness, both colonized 20 years ago. Professor Orion is the leader of the light moon’s people. They created an artificial atmosphere and agriculture has thrived. The moon of darkness is in a geo-synchronous orbit over Skeletor’s domain. It is controlled by King Barbo, a barbaric warrior. The last two years has seen a technological wonder, a mirror system to direct sunlight to the dark moon. This system is the basis of continued peace between the peoples of each moon (The Shadow of Skeletor). There was a war with orcs, that saw many human soldiers dead or disabled (Double Edged Sword). King Randor is king of Eternia. His family has held power there for generations. The Royal Palace is the strongest kingdom in Eternia. With outposts dotting the entire globe. Yet, the world is still factioned. There are many kingdoms, tribes, and peoples. All separated by distance, dangerous landscapes, and beliefs. Mattel produced a toy line for the characters. Many times, the toys were made first, so vehicles and equipment in the show looked identical to what was sold in stores. These were incorporated into Filmation’s animated series. The common formula was to have static characters within a static backdrop. A problem would be presented, and the characters would spend the episode solving it. By the end, all would return to normal. This way, audience members could pick up any show in the series without needing to know what occurred in earlier episodes. The show was the first animated series to be produced for a five day a week run. This intense schedule meant the Filmation team had to be inventive. The animators used a technique called “same as”. For instance, if a character was animated climbing a wall. Another character could easily be overlaid into the exact same position and motion as the original.. This technique allowed production to go much quicker. It had its drawbacks too. Heights of characters, for example, can’t be easily known just by comparing characters side by side in a frame. Therefore, our listed heights and weights are a best guess, using W.org’s Height and weight values for super-heroes article as a reference. There are no official heights and weights for the Filmation versions. Another idea was to flip frames over if they wanted a character facing the other direction. So, a character may hold their sword with either his left or right hand interchangeably. One obvious limitation to this technique was with the character, Trapjaw. Trapjaw had a mechanical right arm. When flipped, well, then he had a mechanical left arm. All characters at times may break the barrier between themselves and the TV audience. Of course, during the moral at the end of each show but also at times during an episode. A character, usually He-man or Orko, will look at the camera and say or do something obviously intended for the audience. The Special Skeletor’s Revenge was ran to promote the final batch of He-man episodes. Much of its dialog was aimed at the audience. The He-man and the Masters of the Universe “bible” has all the rules for the show. It had the background for all characters. What their powers are. How they are related to one another. And how pro-social values would be built in. These established rules were also supposed to be used for marketing the toys. Filmation demanded total creative control over the series. As the series became successful, Mattel demanded more and more characters and accessories, and on it goes. Some producers cared more about moving a specific plot along than sticking with continuity. Along with this, with any long running series, mistakes happen. So, there are occasional inconsistencies. New characters were introduced as the series progressed. In their debut, most displayed better skills and over-all competencies than they would in later appearances. Characters in He-man and the Masters of the Universe and She-Ra Princess of Power are extra adept at disguise. They can fool even intelligent and perceptive individuals. While operating in their own genre all disguise attempts gain a +1 C.S. bonus to AV/EV. The No-prize Hypothesis for this is that there are so many different-looking humanoids on Eternia. The individual Eternian wouldn’t think it odd if someone looked a little strange. Only He-man and She-Ra may invoke a special Genre rule. Allowing them to increase APs by Pushing or HP expenditure up to X3 their normal level (instead of the usual X2) once per scenario. This reflects how these characters would pull some stunt beyond their normal abilities. During the Jacob and the Widgets episode, He-man pushes one of Eternia’s moons out of orbit. She-Ra repeated this feat twice in her own series – Bow’s Farewell and Swifty’s Baby. There was at least one episode (Assault on the hive) where, like a Hanna-Barbera cartoon, it seemed there was air and atmospheric pressure in outer space. By default, everybody in the universe had infinite “Sealed Systems”. This was counter to many other episodes where characters put on a helmet or used space craft. In the Masters of the Universe series there are wealthy Kings as well as poor farmers. Skeletor mentions paying with silver. The location of treasure is incentive for quests. In general, the good-aligned people are wealthier than the evil. It’s the opposite in Etheria where the Horde rules. The good have greater technology and overall quality of life. Most wealth is accumulated into the many kingdoms or lost to time. While individuals would have very low Wealth scores. Still, nailing down values for individuals is quite difficult. The topic is not touched on except in a broad sense. Poor, evil including the barbaric tribes – 00 APs. Poor, good peasants – 02 APs. Generic soldiers of any army – 04 APs. Ranked soldiers or some tribe leaders – 06 APs. Village elders/leaders – 10 APs. Small Kingdoms – 15 APs. Large Kingdoms (The Royal Palace) – 20 APs. Arcalite. A mineral used to power the force field over Arcadia. Bambyte. Anthropomorphic animals use a crystal called Bambyte to hide in the forest while gathering food. It makes them invisible. Corithium. Impervious stone. The sun stone was housed within a block of it. Only the ruler and his son’s magic may open it. Corodite. Strongest metal in Eternia. Mined in only one location, the Widgets Fortress. BODY 12, Flame Immunity: 06. Also, a power source with a high melting point. Eternium is considered the strongest substance in the universe. He-man’s sword swings just chinked against it. He-man said that it would take too much time for the Power Sword to cut through. BODY 22. It’s also an energy source supplying power to the Royal Palace. Memorio. This rare material is attracted to powerful energy sources. Reflected sunlight through this material can counteract amnesia caused by magical means. Mor-fire stones. Gems that give Phantos their power. They cannot be removed except by a member of the Phantos tribe leadership. No relation to the planet Phantos. Photanium. Strongest metal in the universe according to Man-At-Arms. Many of the weapons at the Royal Palace are made from this ore. Found only on the planet Phantos. BODY 21. Rainbow Quartz. A mineral used in Man-At-Arms’ communications relay. There is only a singular supply left in all Eternia. It can be found in a natural cave in Snake Mountain. The Quartz vein runs through the entire mountain. It is marked by an iridescent glow. Arcadia. Ruled by Queen Sumanna. A city of women with an intense hatred of all men. Castle Fear. Located in the Swamps of Enchantment. Owned by the Enchantress. Castle at the Edge of the Mystic Mountains. Controlled by Baron Grod. Castle Star. Lord Todd, a lover of games and sleight of hand magic owns this castle. City of Colmay. Meteors once struck this city. City of Drisdose. This was a stop on King Randor’s trip. Dysperia. Adam’s Uncle Stefen’s Kingdom. Threatened with war by the Torks, an underground dwelling race. Eternian Weather Station, located at the top of the world. Duncan says the Weather station allows them to control the climate for all Eternia. Then why do they have so many storms?… ah well. Gamalon. Only mentioned by Randor. Part of his Kingdom. Kingdom of Morainia. An ice kingdom where they have perfected energy crystals that are ten times more powerful than any other in Eternia. Land of Myr. A goblin army arose there, led by the goblin General Tateran. Phantos tribe. Friends of Man-at-Arms and an ally to The Royal Palace. Province of Dissellia. There was a mention of trouble there. He-man and several heroic warriors went to investigate. Ruxstown. 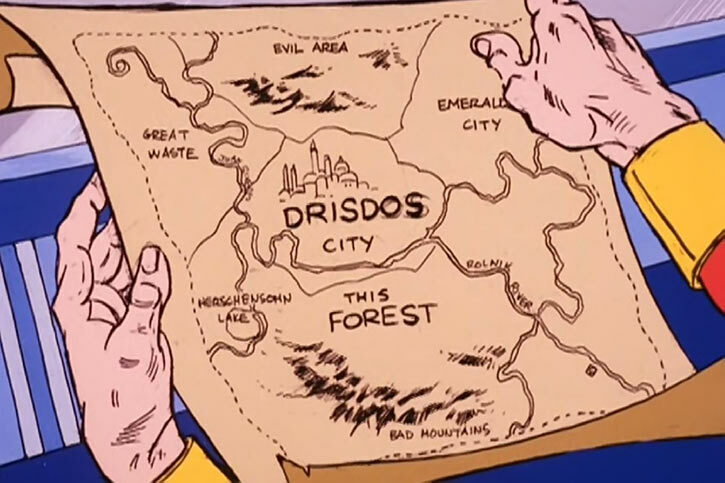 One of King Randor’s colonies in the North country with no close neighbors. A naive and superstitious people living at the base of Mount Fear. Stardika. Only an old fortress located here that hasn’t been used in years. Tandor Village. This village has a shrine that houses the Gryphon’s jewel. Tarrin. Pangis is Prime Minister here and friend to King Randor. Yaug, a powerful creature, was kept asleep by Celise’s singing until He-man dropped the creature in a bottomless pit. Valley of Operon (the good city) ruled by Princess Rhea and her father King Thales. The Gargons of the city Targa (the bad city), Queen Balina pays for captives. Two cities in conflict. Village of Peace. After a trick caused dragons to destroy this village, Granamyr rebuilt it with his magic. It would stand as a new treaty between dragons and men. Dam of the Ancients. Once broke and flooded the Fertile Plains. Fertile Plains. Dwarven farming communities who supply the Royal Palace. The Great Eternian Dam. Built by Man-At-Arms, supplies many farmlands with water. Arodin, a kingdom in the desert. The fountain of life is there. City of the Ancients. An enormous golden city. An Indiana Jones-like setting in the middle of an old jungle. City of Eternals. A magical city that was ruined by the mystical energy surges caused by the weakening rift between the Dark Dimension. Stone City – AKA the city of ancient warriors. An ancient ruin, its people turned to stone. Brought back to life with He-man’s help. Their leader is called Vulcan. Mount Eternia. Volcanic with an ancient temple housed inside. Temple of the Cat. King Paw rules a race of cat-folk living in the nearby jungle. Temple of Shokoti. Ancient temple with an evil power inside. Temple of the Fire People. They guard an artifact called the Spellstone. Temple of the Sun. Located in the Sands of Time. Banshee Jungle. Became a desert when Tabor the magician mis-cast a spell. Crystal Cave. Home to the singing crystals. A myth that turned out to be true. Crystal Mountains. Mount Zeelyte is the only place in Eternia where a special herb, Vimwood, grows. This herb is the only known cure to the Dauber’s venom. The Dauber is a little known deadly insect. Dark Lands. A benevolent wizard by the name of Kor rules here. His soldiers are Reptile-men. Ages ago the Red Scourge rampaged across the land burning everything. Each generation a wizard is selected to see that the Scourge never escapes. Kor is keeper of the flame. He-man defeated the Scourge with the water from an underground river. Dark Smoke. Home to the dragon, Granymyr. Ice Trolls live in the surrounding areas. Granymyr may be the most powerful being on all Eternia, including He-man. There is a treaty between humans and dragons. The dragons would remove themselves from the rest of the world, but then could do whatever they want and would be left alone. The East Fen. Only mentioned once. Echo Valley. The slightest sound causes rock slides within the valley. Enchanted Forest. Skeletor sent Glitch there when he failed to prove himself. Forgotten Forest. Home to Sky Tree, the oldest living thing on Eternia. Tolimar the Treeplichaun (a tree-leprechaun with Irish accent and all) is guardian of this forest. Haunted Forest. Near the Royal Palace. Hourglass mountain. Home to the keeper of time. Princess Cathay, a Chinese girl is on a journey to rescue her father, the Emporer of Simbar, when she gets help from He-man and friends. There is a council of Seasons made up of two men and two women who I assume are immortal magical beings who control each of the four seasons. Isle of tears. King Danton was overthrown by Gorgon with the help of a sorceress, Sibyline. She once turned an army of men into fish with feet! It took the Sorceress of Grayskull to turn them back. Lost mountain. A floating prison. Mount Fear. 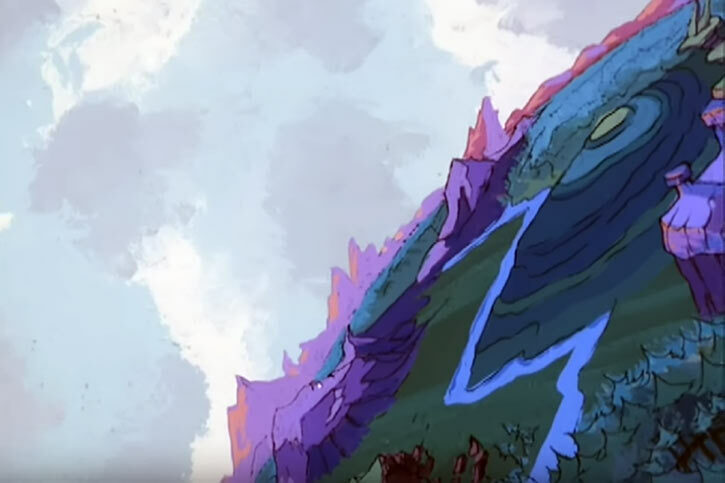 The most dangerous mountain in all Eternia. Mystic Forest. Similar in nature to the Vine Jungle with its dangerous plant life. Mystic Mountains. Ogres live here. Palonia. There has never been a giant in that area. Rose Mountain. The bitter rose grows eternally here. Sands of Time. A vast desert. Slime Swamp. Mer-man found the Dragon pearl here. Stone Mountain. A young wizard, Malic, lives there with his assistant. Tar swamps. Tar pits. Everything sinks here. Valley of Echoes. Not to be confused with Echo valley. Voices and memories of times past could trap you inside forever. Valley of Power. A fountain of power rises here every thousand years. Drink from it and gain a strength equal to He-man’s. The “tickle-trap”. If attacked it squirts a liquid harmful to humans, but if you tickle it, it lets go. The catcher plant looks like a giant Venus fly-trap. It drops straight down on any unwary victim that walks under it. Hunger Lilly is another that shoots out a long tongue dragging its victims to its mouth. There are Ogres that live there too and at least two groups of humanoids. The tree people who dress in green and look like elves while the cave people look like humans. Both claim guardianship of the “Star Child”. A young girl with energy powers. Palos is leader of the Cave-dwellers, while Willan, an engineering genius, is the leader of the tree people. Whispering Valley. Part of the Mystic Mountains, a group of fairy folk called the Solani live here. Widget Woods. Home of the gnome-like Widget fortress. Zagrass Mountain. Home of the wizard Zagrass who controls comets. Avathar is an island that only existed in the Legends of Eternia. It was supposed to be the most powerful nation in the history of Eternia. Today, it is only a small island with ruins. The Crystal sea. Has a reputation as a dangerous place. 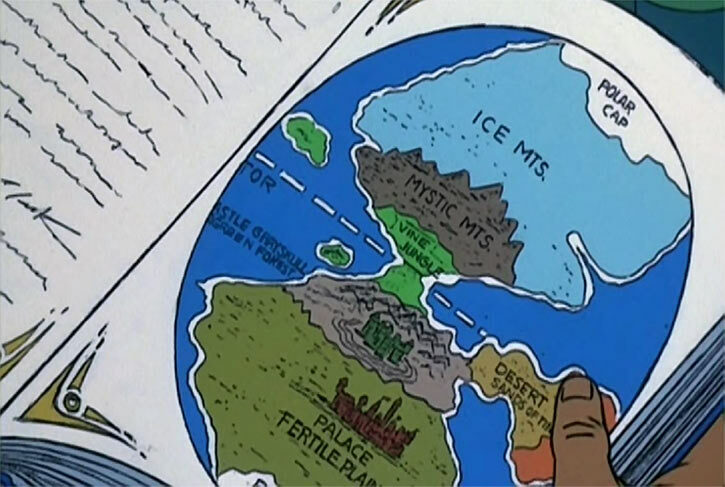 It is home to the Oracle and Mer-Man’s home territory. Harmony Sea – Aquatica. A city is on the floor of this sea and has a machine that creates Whirlpools. With it they pull down ships and capture its crew. Aquatica is a city of great wealth with gems as large as a person. The city has conveyer belt walk-ways for easy travel. Aquatica is ruled by Princess Nami. Lake of the Lost. The Ring of Remembrance was detected there by its unique element (Memorio) signature. There’s strange magnetic readings all through that area. The last time Man-At-Arms took a Wind-Raider through there he had to recalibrate all the instruments. Sea of Eternity. Located in the Mystic Mountains. It feeds a river which supplies the vine jungle and Evergreen forest. Selkie Island. Hovar, King Randor’s royal Historian, and his son, Justin, set up base there. Bright Moon. Professor Orion rules here and brokers a friendship treaty with the Dark Moon. Dark Moon. Ruled by King Barbo, the people who live there have hard unhappy lives. Demon Zone. A door to this demonic realm is in the Doom mountains. Netherworld. A realm of demons. Omerose. A strange magical world. A two-headed man named tick and tock was met here. An evil wizard controls Castle Ackel. Phantos. Queen Elmora, a sorceress, rules there. The metal Phantonium is an export. Phantos has three moons. Trolla. Orko’s home world. One part of it is called Caradania, the land of practical jokers. Like Superman’ enemy Mr. Mxyzptlk, once they say their own name they must return to their own universe. It’s part of their magic. Orko says Trolla is completely ran by magic. This magic is controlled by the Crimson council. Their King Blim, is called the High Muckamuck. The Queen Foosabella, called the Muckess on Trolla. While Blim is a laughing jovial lack-wit, the Queen acts like a snobby socialite (She-Ra episode: The Great Magic). Flotsam Prison, out in the Sing-song sea. Holds Trolla’s worst villains like, Zoog, a Trollan who thinks Trolla should be ran by machines not magic. The master farmer, Agar and his son, Garda, produced the best food crop they had in years. His farm had many large pieces of farming equipment and dome houses like the ones in Star Wars. Teela and Orko treated the crops as if they were their own. Granymyr. The oldest and most powerful creature on Eternia. His magic was able to hold He-man and Teela at the same time, using rings of magic force. Kothos, an evil wizard, has a stronghold in the mountains. He-man convinced Kothos to do good instead of evil. Kothos will fly his palace over all of Eternia. 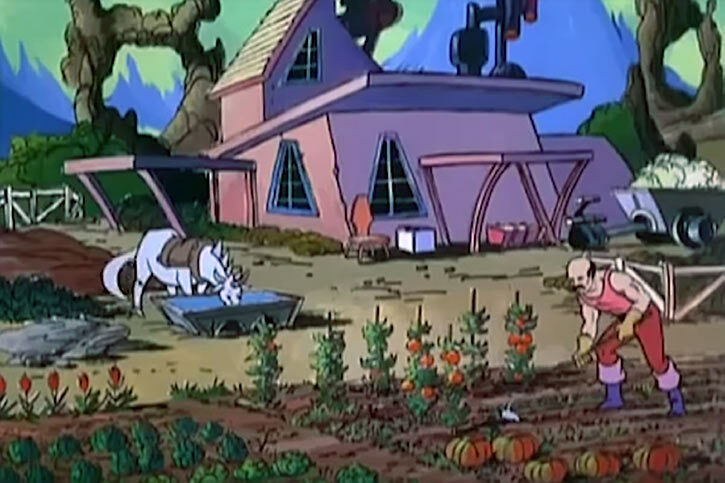 And whenever a farmer needs rain for his crops, Kothos’ instant weather service will be there. Orko’s Uncle Montork. His magic worked fine on his second visit to Eternia. When the Crimson council was removed, he sent his students to round up every wizard they could find to do the work of the council and keep the magic in order. The intergalactic police. Known and trusted by Adam and Teela. They will pursue criminals through space or even dimensions. Eternia proper would make a fantastic backdrop for a Role-Playing campaign. My suggestion would be to remove the three most powerful characters, He-man, Skeletor, and the Sorceress. Then, fill those vacuums with existing characters or player characters. Down the road in the campaign as players are getting comfortable; the GM could have the Horde try to conquer Eternia again. 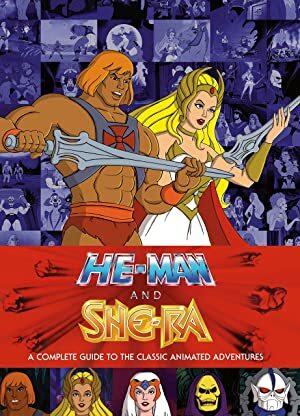 Source of Character: Filmation Presents 1983/1984 animated series He-Man and the Masters of the Universe, the 1985 movie The Secret of the Sword, the 1985 movie He-man and She-Ra Christmas Special, the 1986 Skeletor’s Revenge, The 1983 He-man: The Greatest Adventures of All, The 2017 The Power of Grayskull: The definitive History of He-man and the Masters of the Universe, He-man and She-Ra: A complete guide to the animated series. Helper(s): Wikipedia, he-man.wikia.com , YouTube, Sebastien Andrivet. Writeup completed on the 30th of March, 2019.